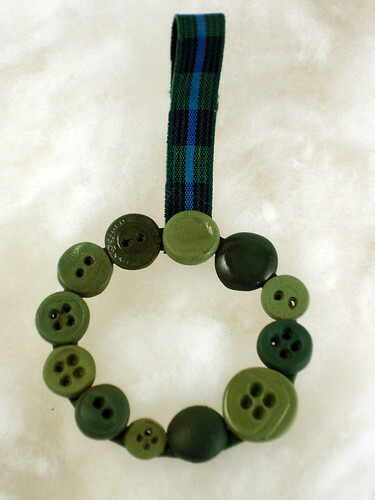 I love the vintage button wreaths I've been seeing on Flickr. But what if you don't have enough vintage buttons in coordinating colors? Or perhaps you're like me and you're unwilling to commit the buttons you do have...? 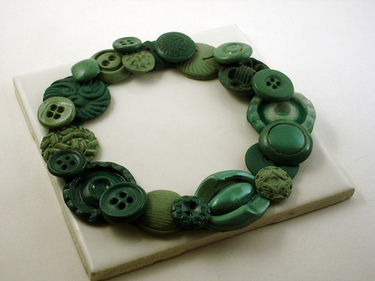 I used mold putty and polymer clay to put together this monochromatic button wreath. Of course, there are unlimited possibilities — using different colors of buttons, different shape bases, etc. And hey, if you've got almost enough real buttons to make a wreath, you could just use these steps to fill in the holes with some color-coordinated polymer clay buttons. Here are the basics to get you started. 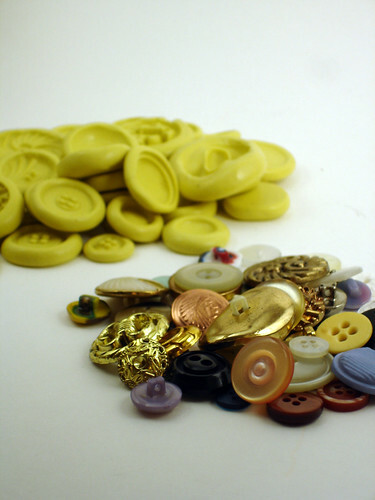 The number of buttons you'll need varies based on the button size and the size of your wreath base. To give you a general idea, though, I used 26 buttons on my large (4") wreath and 12 buttons on my small (2") wreath. It's a good idea to make a few more buttons than you think you'll need. While it's fun to have the different shapes, textures and sizes of different buttons, you can just use the same one or two button molds for the whole wreath. 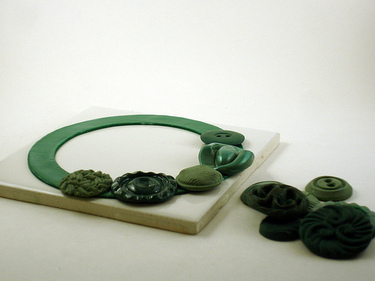 Try using different colors of clay with one button mold for a simple, coordinated look. If you're going for a monochromatic look, start by mixing up a color of clay you like. 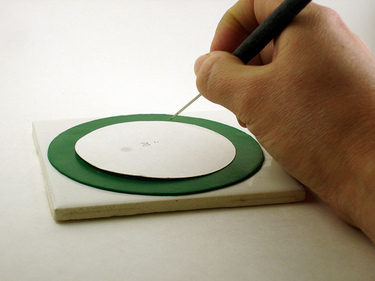 Make some of the buttons from that color, but then vary the shade by adding some white or black clay. I made 3-4 shades of green for my wreath this way, and I think it gives it a little more interest. 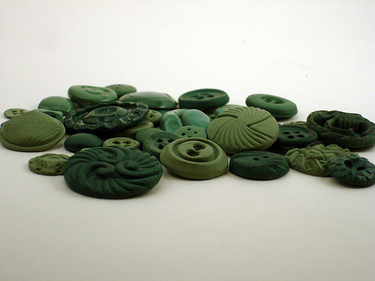 I went ahead and baked my polymer clay buttons, so they'd be more firm and button-like during the wreath construction. You could do it either way though. Make a wreath base. I rolled out my clay to a medium thickness on my pasta machine. I put that sheet on my baking tile, since it would be difficult to move without distorting later. I then used 2 paper circle templates to cut out my wreath: a 4" template for the outer circle, and a 3" template for the inner circle. Of course, you can make your base any size or shape. I've seen some gorgeous heart-shaped button wreaths that would be great for Valentine's Day. I left my wreath base from the previous step un-baked, then put down a layer of TLS to act as a glue between the base and the buttons. Remember that TLS only acts as a glue between baked and unbaked clay (not baked to baked). So when I needed to stack buttons, I first added a thin sheet of unbaked clay and used TLS to "glue" it to the previous layer. Add your finishing touches. If you still have part of your clay that's un-baked, bake it now. I used Future on a few of my buttons to give extra shine here and there — I liked how that gave it more variety. Finally, add a nice coordinating ribbon and hang your wreath! Rachael Herbert of Sweet Nothings posted a tutorial for her very cute Mini Button Wreath Ornament. From Flickr, check out button wreaths by little birds (monochrome red), Lin Moon (monochrome white), craftapalooza (red & white), and mikamika (retro brown & pink). 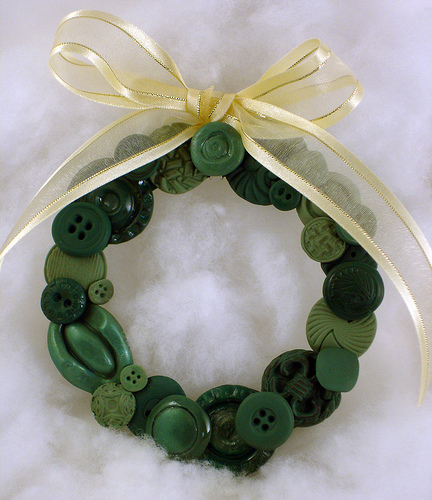 Tutorial for making a holiday button wreath out of polymer clay buttons.